Today I took another opportunity to get out with my gear, as a trial run for the RaDAR Challenge coming up on 01 April 2017. Normally I’m very frustrated with the timing of the November and April RaDAR Challenges, but since the mid summer challenge was added, I do my best to support April and November, although they come at the worst possible time for WX up here at 65°N. Still, if I don’t like the way something goes, I can anyways change the way I think. ? So for the past few days, I’ve loaded up the skipulk with radio gear, pulling it during my daily 5k dog walk with the hairy fellows. I don’t use any running gear with the skipulk. I chose to make a sling harness which goes over the shoulder, terminating with a carabiner. Then a 2m length of Edelrid climbing rope, between myself and the pulk. Yes it’s overkill, but I have several rolls of the stuff. The set up looks something like this. 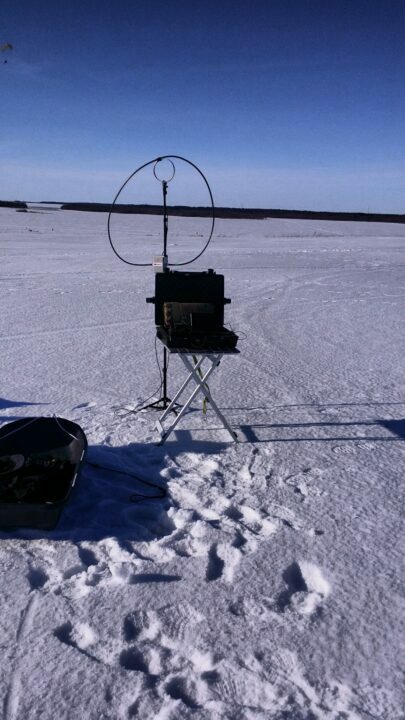 The FT-817nd deployed out of a pelican case, the antenna on a tripod. Laptop also deployed from the pelicase, but that is overkill for RaDAR. It might not be completely obvious, but using the pulk, I really can carry an enormous amount of gear, without any effort. In the next image, I packed the 817 and everything into a small tactical backpack. Through the backpack in the skipulk, which made carrying and deployment very easy. I did have one hard lesson. The P-LOOP tripod is magnificent but, the magnetic loop is top-heavy. Not operating from indoors, in the forest or any place where wind is no issue, the small tripod is excellent. Operating exposed near the sea is always going to be windy. So the magnetic loop on the small tripod fell over a few times. On my next trial run I’ll use the MPAS tripod, which has a larger base, making it much more stable in heavy winds. More about the skipulk. The pulk also gives me the ability to carry multiple antenna systems. I’m deploying the P-Loop 2.0 in the image, because I’m working on a video for that system. I could be carrying any number of systems, depending on where I’d liked to operate. For example, If I’m on the ice, where a tripod is an absolute must, I could switch to an antenna system compatible with large tripod deployment. If I’m in the forest perhaps I could use some sort of wire antenna. Anyway you get the idea. Digital and phone. Normally during radar challenges, I like to work digital modes. Like CW, narrow bandwidth digital modes are much more efficient than phone. This really helps my qrp signal get out and about around the world. During this training run, I’ve stayed with single sideband operation. Single sideband is really the worst case scenario for the radio and antenna combination. It also prevents me from having to take off my gloves and get myself cold, when I am exposed (as I normally am). I’ve got something coming from Samsung, who decided to show some kindness to the channel. It’s an IP67 rugged tablet, that’ll work with gloves on. If that device arrives in time and I can get it set up for the radar event on 01 April, I think we’ll do both single Side Band and perhaps psk, in an ultra portable configuration. Yaesu FT-817ND in cold WX. I hear a lot of rumors about the 817 not actually working in cold weather. That’s ridiculous. I routinely operate the 817 at temperatures down to minus 20c. The trick to cold wx operating success may be this. I’ve always got my 817 packed in a backpack near my body. If the 817 is outside the backpack, it’s turned on and generates its own heat. If I have the 817 in a Pelican case you should also remember that the Pelican cases completely airtight. Another operating scenario my 817 has never failed or shown any strange symptoms in cold weather. Food for thought. Anyway here are some pictures from the last few days.